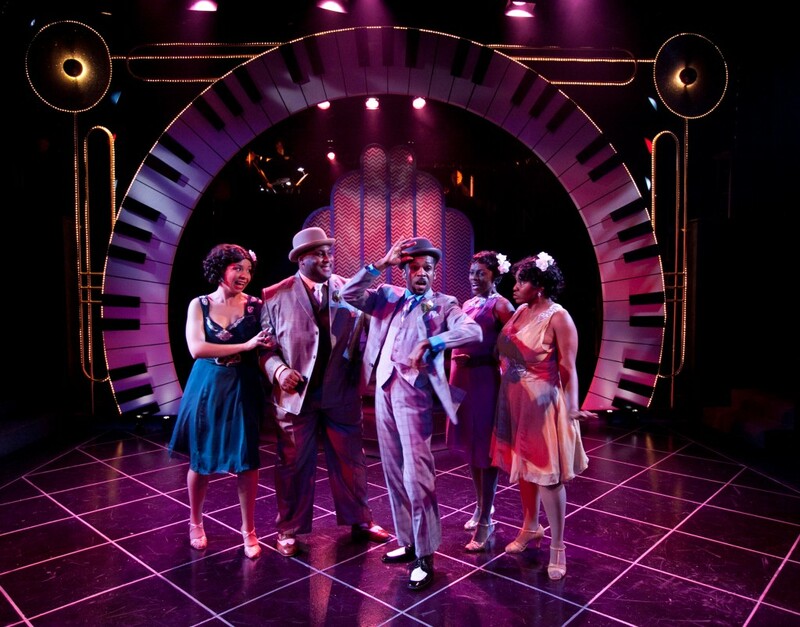 (Boston, MA) With its familiar melodies and disarming 1940’s Harlem charm, Ain’t Misbehavin’ is probably the most energetic musical revue I’ve seen. Done with precision and love for original composer Thomas “Fats” Waller (here played by Calvin Braxton), the show is a tribute to an era that evaporated long ago. It replicates the energy of the time as best as it can with vibrant musical numbers and tight choreography. Like any revue, rather than a unified plot, the production lightly hops from swing number to swing number. The lack of dialogue allows the cast of five free range in regards to the interpretations of and relationships between their characters. Knowing glances between actors show the ebb and flow of romantic interest and emotional conflict. Audiences looking for a solid story beyond the ones contained in the lyrics of each song should probably look elsewhere. Broadway aficionados, modern history enthusiasts, and viewers willing to give songs like “Honeysuckle Rose” and the heartbreaking, racially charged “Black and Blue” a chance should stick around. Lori Tishfield, playing a rookie to the Harlem scene, has the closest thing resembling a character arc. This is signified by a singing voice that changes from a babyish squeak to a beautiful belt by Ain’t Misbehavin’s final number. Her journey mirrors that of the audience: an initial, playful step into a wild time period and the eventual respect for the era’s particular beauty. But the show belongs to Lovely Hoffman, a contemporary R&B artist whose voice and stage presence light up the room. Solos like “I’ve Got a Feeling I’m Falling” and “Mean to Me” steal the entire show. Actors Robin Long, Davron S. Monroe, and Braxton bring humor to the production, but Hoffman’s soulful numbers give the show grace. The musical revue runs like a “well-oiled time machine”. It’s a fun glimpse to another era, one that audiences may be hesitant to leave once the last song comes to a close and the lights come on again. This entry was posted in Musicals and Opera and tagged "Fats" Waller, 2011, African-American, Ain't Misbehavin', “Black and Blue”, “Honeysuckle Rose”, Boston, Calvin Braxton, Davron S. Monroe, December, Harlem, Lori Tishfield, Lovely Hoffman, Lyric Stage, MA, November, Robin Long by gilliandaniels. Bookmark the permalink.